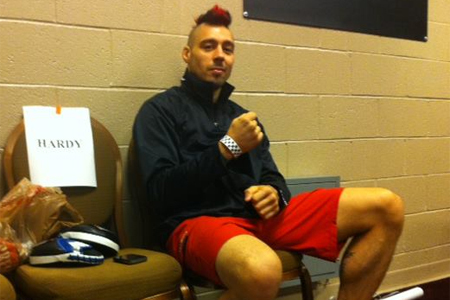 Early Friday morning, the UFC announced an undisclosed injury has forced Dan Hardy (pictured) out of next month’s scrap against Matt Brown. As we all know full well, the Octagon show waits for no man as Jordan Mein has agreed to serve as a last-minute substitute at UFC on FOX 7. Mein is merely six days removed from posting a TKO victory over Dan Miller at UFC 158. The Strikeforce transfer has won nine of his past 10 tangos. Brown has quietly ran through his last four victims. “The Immortal” put Mike Swick to sleep on FOX in December. Hardy and Brown were slotted to kick off the live FOX broadcast. The new welterweight matchup is expected to maintain the position in the lineup. No word on how long Hardy will be forced to ride the pine. HP Pavilion in San Jose hosts the April 20 festivities. FOX broadcasts the main bouts beginning at 8PM ET/5PM PT.